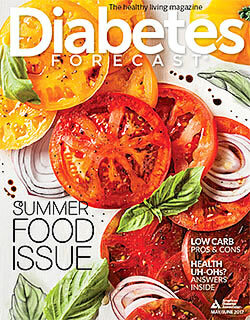 Be sure to see the latest Diabetes Forecast magazine articles about this topic. Eat more! You don't often hear that when you have diabetes, but non-starchy vegetables are one food group where you can satisfy your appetite. Vegetables are full of vitamins, minerals, fiber, and phytochemicals—and with so few calories and carbohydrate, everyone can enjoy more! There are two main types of vegetables—starchy and non-starchy. For this section, we are going to focus only on the non-starchy vegetables. Starchy vegetables like potatoes, corn and peas are included in the "Grains and Starchy Vegetables" section because they contain more carbohydrate. Choose fresh, frozen and canned vegetables and vegetable juices without added sodium, fat or sugar. If using canned or frozen vegetables, look for ones that say no salt added on the label. If using canned vegetables with sodium, drain the vegetables and rinse with water to decrease how much sodium is left on the vegetables.